Have you ever noticed that people who have turned their backs on God need more, more, more?! I have often told the analogy of the God-shaped hole inside all of us that can only be completely and satisfactorily filled by God Himself. We try to fill it with “stuff”, with relationships, with drugs, with food, with alcohol, with hobbies, with projects and careers, but the pleasure from these things is short lived, leaving us wanting more, more, more. Babylon was full of idols and statues. There were statues errected to everything – water, earth, love, war. Godless people, realizing the deep need to connect with God, but rejecting the one true God, set up many gods. When they got tired of bored with those, they set up more. So it was with King Nebuchadnezzar. He somehow gets this idea to build a 90 foot staute of himself made of solid gold (could it have been the miracle dream interpretation God gave Daniel?). Obviously a music fan, the king commanded that whenever people heard music, they were to bow down to the newest statue. 3 When all these officials had arrived and were standing before the image King Nebuchadnezzar had set up, 4 a herald shouted out, “People of all races and nations and languages, listen to the king’s command! 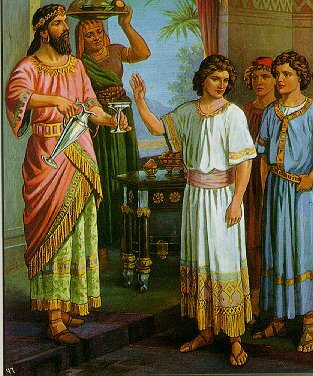 5 When you hear the sound of the horn, flute, zither, lyre, harp, pipes, and other instruments, bow to the ground to worship King Nebuchadnezzar’s gold statue. 6 Anyone who refuses to obey will immediately be thrown into a blazing furnace.” 7 So at the sound of the musical instruments, all the people, whatever their race or nation or language, bowed to the ground and worshiped the statue that King Nebuchadnezzar had set up. Can you imagine? That would get old after a very short time. 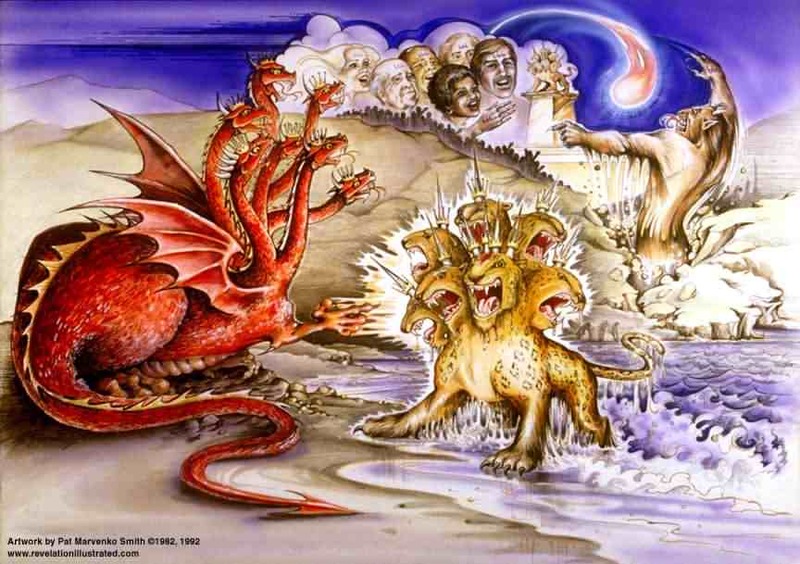 You know the rest of the story, our Jewish friends who had recently been captured and exiled to Babylon, now in service to the palace of the king, all refused to bow – prefering instead the risk of certain death in a furnace. How fleeting the honor bestowed on them by this king. From prisoner to stewards of all the affairs of the province of Babylon – to death by fire. I often wonder if it was faith that God would spare their lives, or the simple refusal to bow to such a vile, godless king. What I read about the Jewish culture tells me they are very proud and honor is vital to the nation of Israel. 28 Then Nebuchadnezzar said, “Praise to the God of Shadrach, Meshach, and Abednego! He sent his angel to rescue his servants who trusted in him. They defied the king’s command and were willing to die rather than serve or worship any god except their own God. 29 Therefore, I make this decree: If any people, whatever their race or nation or language, speak a word against the God of Shadrach, Meshach, and Abednego, they will be torn limb from limb, and their houses will be crushed into heaps of rubble. 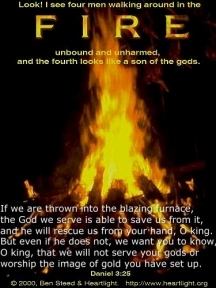 There is no other god who can rescue like this!” 30 Then the king promoted Shadrach, Meshach, and Abednego to even higher positions in the province of Babylon. In the end, God received the glory because of the decision these young men made. They took a stand – took the risk – and God was honored. And, so were they. How do you appy this to your life? What compromise are you facing? Isn’t it much easier and less risky to compromise on your beliefs, and go along with the crowd, or satisfy some desire for momentary pleasure? Consider the rewards and the honor God would receive if you decided to take a stand.